The hog cholera virus found in a recent outbreak in the central Japan city of Gifu may have been brought from abroad, an analysis by the farm ministry showed Friday. The gene sequences of the virus were different from those that previously caused swine fever outbreaks in Japan, according to the Agriculture, Forestry and Fisheries Ministry. Meanwhile, a wild boar found dead Thursday within a 10-kilometer radius of a farm where the latest outbreak occurred earlier this month tested positive for hog cholera, the Gifu prefectural government said. The boar will undergo further detailed tests carried out by the central government. The carcass of the female boar measuring about 1 meter in length was discovered in a roadside ditch, roughly 7 km from the farm where a pig was found dead on Sept. 3. The central government confirmed last Sunday the hog had been infected with the swine fever virus. Separately, about 140 pigs that died at the farm over an eight-day period through Monday are believed to have died of hog cholera. Of that number, the carcasses of 80 pigs together with manure were transported to the city for composting at a center about 7 km from where the dead boar was found. 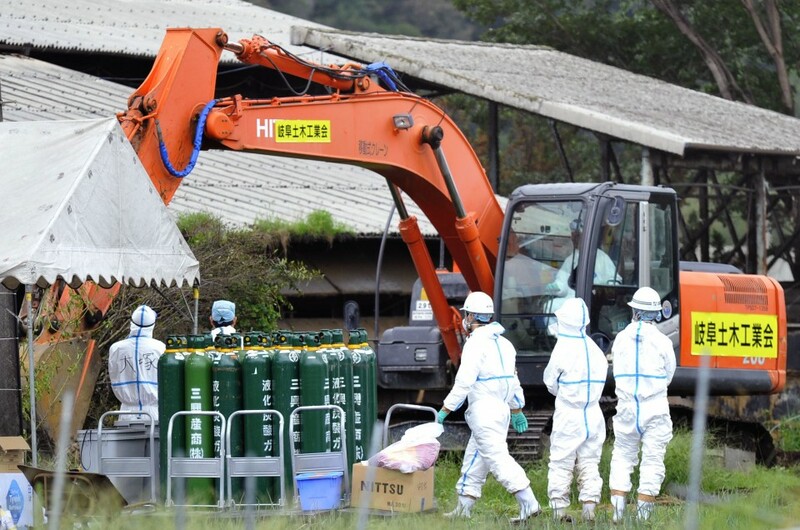 The prefectural government will conduct onsite inspections and blood tests to detect if any abnormalities are present at farms keeping pigs or boars in the area within 10 km from where the dead boar was found. All 546 hogs were culled at the Gifu farm on Sunday and Monday, and the ministry announced Tuesday all measures to prevent the spread of hog cholera have been completed. Two other wild boars were also found dead on Aug. 21 in an area within 3 km from the farm. Hog cholera is endemic in Asia but does not affect humans even if an infected animal is consumed. The disease, which only affects pigs and wild boars, has a fatality rate of almost 100 percent. It is the first time since 1992 that a hog cholera infection has been confirmed in Japan. Tokyo declared the virus eradicated in 2007.